Pottery has served an important function throughout history. The potter's wheel has had a significant impact on the production of pottery and is still considered a valued tool to this day. No one individual can take credit for developing the potter's wheel, but discovery of the ancient pottery equipment has helped in establishing its origin. A simple revolving wheel dating back to 3000 B.C. was discovered in Mesopotamia, the area between the Tigris and the Euphrates Rivers. Pottery was considered a skilled craft in Egypt. The potter's wheel serves to expedite the production of pottery; it allows potters to quickly manufacture their pieces. 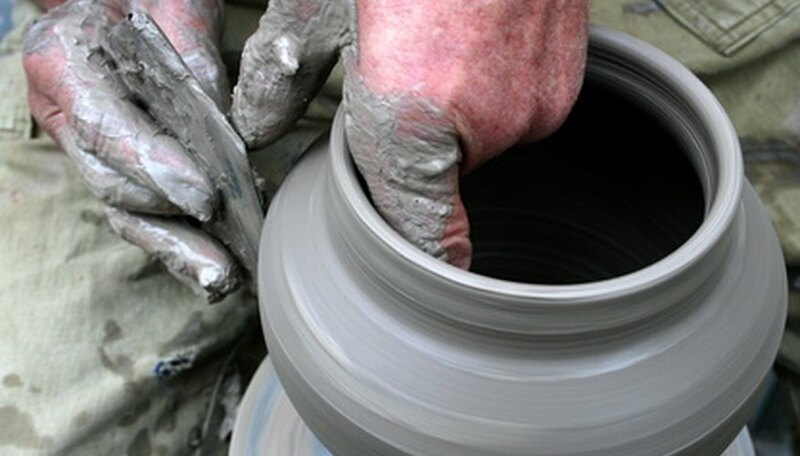 A potter's wheel also creates a more stable working environment so that pottery can be created levelly and evenly. The first potter's wheel was a small stand that the potter could slowly move around while shaping the clay in a fixed center. This later evolved into a revolving potter's wheel that allowed the potter to turn the wheel with one hand while forming the clay with the other. The most modern version of the potter's wheel, called a kick wheel because it is manipulated with a foot, allows the potter to use both hands to work the clay. Luca Cusolito began writing in 1997. She utilized her web design skills to self-publish her short stories and articles. She writes most frequently about real estate, wine and beauty products. Cusolito studied communications at Florida Atlantic University.